Use fresh, supple dates and serve the salads immediately they are topped with fried haloumi. This makes an exquisite starter, or an accompaniment to a roasted chicken. 1 Heat a smidgen of olive oil in a small frying pan over medium heat and add pine nuts. Toast briefly until golden. Transfer to a plate lined with paper towels and sprinkle with flaky sea salt. 2 Peel pears, cut in half and remove cores. Slice finely, then toss gently with a little lemon juice. Put rocket leaves in a bowl with cos, mint and dates. Whisk together lemon-infused olive oil, 1 tablespoon of lemon juice and ¼ of a teaspoon of salt and pour over salad greens. Arrange greens on plates. 3 Pat haloumi dry with paper towels. Heat a medium-sized frying pan (skillet) over medium heat. Add 1-2 tablespoons of butter. When sizzling, add haloumi. Cook until golden. Arrange on top of salads. Top with pear slices. Shave over a little parmesan and scatter with pine nuts. Serve immediately with lemon wedges. 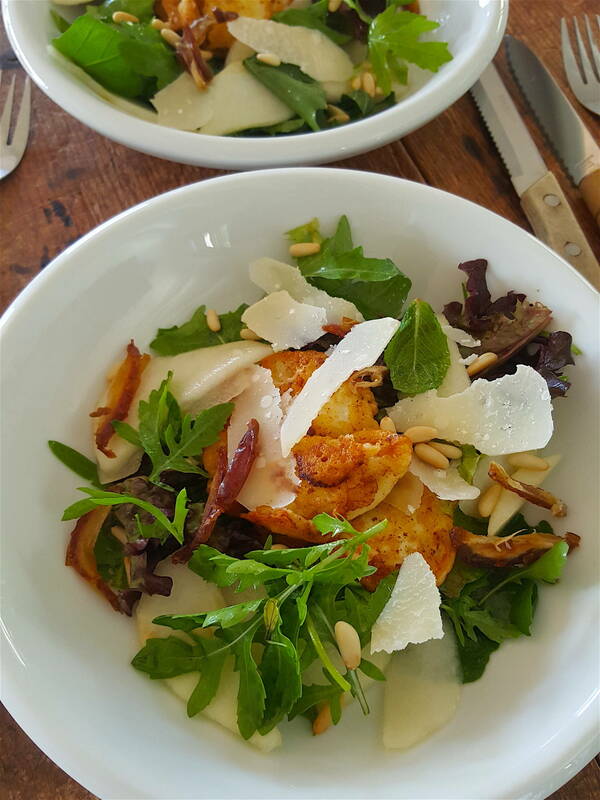 Get yourself all inspired this weekend with a cooking class on Waiheke. Come away with a great repertoire of new recipes and be ready to roll for summer. Who can resist golden crunchy nuggets of goodness? Not me!